The Great Grocery Stock Up is back! 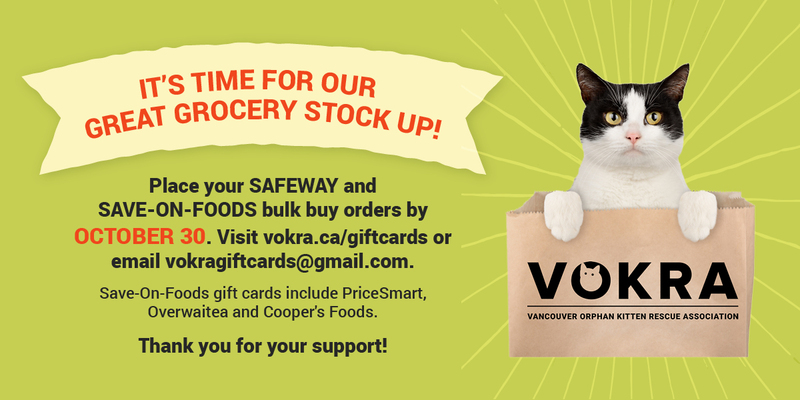 Right now when you stock up on grocery cards from Safeway and Save-on-Foods VOKRA gets 8% of the profits. That can really add up fast! Last year with the help of our fosters and volunteers we raised $2,500 which we used to buy things like cat food, litter and flea medicine. We need to bulk buy the gift cards in order to get this special 8% return and that’s where you come in. We need you to order your Safeway or Save-on-Foods cards by October 30. Cards are available in $25, $50 and $100 for both grocery outlets and you can also get Safeway cards for $250. You get the full value of the card and we get 8% back from the retailer. The cards will be delivered in late mid-November in time for the holiday season. This is a limited time offer so be sure to place your order by October 30 by emailing vokragiftcards@gmail.com and let the gift card team know what you’d like. They’ll confirm your order and contact you to arrange payment and delivery. You can help us reach our goal of $35,000 in sales. That’s a profit of $2,800 for VOKRA kitties! Safeway gift cards can be used at Sobeys, IGA, Foodland, FreshCo, Thriftyfoods, Lawtons & Needs. Save-On-Foods cards can be used at PriceSmart, Overwaitea and Cooper’s Foods.